For a fall weekend lunch pulled together with NOTHING in the fridge, I’m pretty proud of this Roasted Butternut Salad. I found three almost-to-the-wrinkled-stage butternut squash(es?) sitting resignedly in the vegetable bin along with some almost-wilted spinach. Peeled and cut the squash and roasted it with a bit of olive oil and half an onion for about 35 minutes. Put it on the not-so-fresh spinach and added crispy cheese bread made from the lonely ends of a pumpernickel loaf and freshly grated parmesan (that, at least, was new and good). Sometimes, being too lazy to go to the grocery turns out to be a good thing. 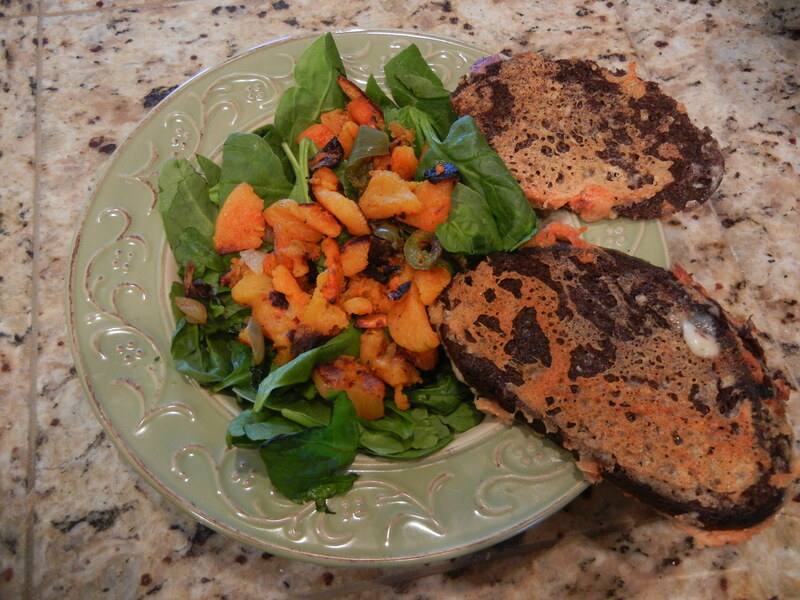 This entry was posted in food, home, shopping and tagged bread, Butternut squash, cheese, fall meals, food, healthy eating, salads, spinach, vegetables by Coffee with Cathy. Bookmark the permalink. Mary — It was good, I promise! I should have called you to come over for a sample.